Teenagers! Agh, a stage that every parent worries about. It can be a huge challenge to navigate these critical years in our children's lives. Our son just turned 12 this summer, and although he isn't an official "teenager" yet, we can already see changes in the way he thinks and acts. Not bad, just different. He has more need to spread his wings, find himself, and is looking to establish his self esteem. The teenage years are a time of huge change for our kids. They are trying to figure out who they are, what they like, and where they are going. Plus, they want to be accepted by not just us, but by their peers also. It is a time of soul searching and identity building. We talk a lot about infants and toddlers, but our toddlers are growing up and it is time to talk tips for our teenagers. 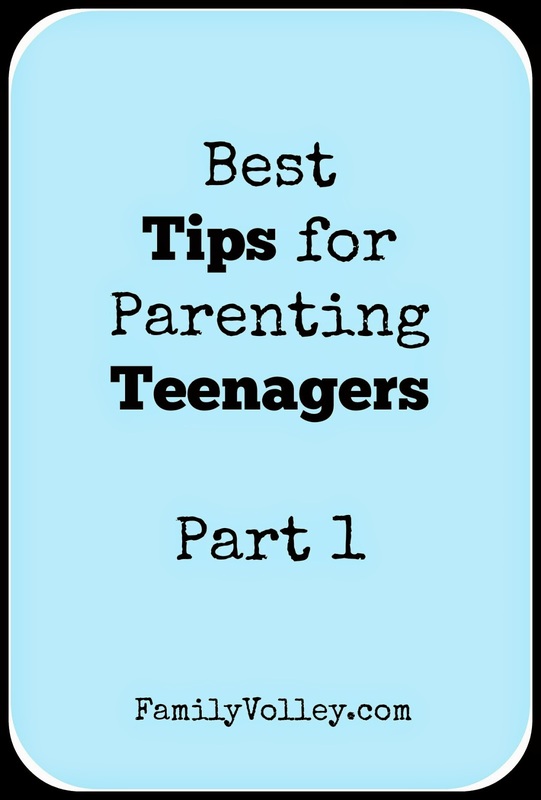 Today, let's start with our first 6 tips for parenting teenagers. 1. Don’t survive the Adolescent years, THRIVE the Adolescents years. Stop labeling and get rid of the stereotypes. We shouldn’t expect the worst during these years. Not all teenagers become monsters. Most teenagers are great. Give them a chance. We live in a universe of attraction and what we focus on and put our energy on is what will become our reality. Focus on how great it is that you have children who are learning who they are and developing their identity. 2. Love them from the inside out. We respond to people, primarily by how THEY feel about us on the inside, not by their behavior. As parents, we can make right choices with our teenagers, but if on the inside, we are irritated, feel they are irresponsible, disappointed in them and their decisions, then that is what they will respond to. That is actually how they will behave. We will bring out in them, the exact behavior we say we don’t like, when we see them as objects that are making our lives miserable. Praise them, compliment them stop nitpicking them. If they know we love them, above all other things, it allows us to discipline, communicate, be honest and open, and they will accept it. 3. Communicate. It is the Golden Rule of raising teenagers. We have to keep the lines of communication open. We have too! There are two times when teenagers want to talk. When we are driving in the car with them. (Don’t have to look at one another, know there is an end so they are more likely to talk. Be available during these times to LISTEN, and instead of telling them things, ask questions so they can discover answers on their own. ANOTHER GREAT PLACE TO COMMUNICATE is over common activities. Find something that you and your teenager can do together AND DO IT. It takes all the stress out and you will find that while you are sharing something enjoyable, they will want to talk and open up. They feel you understand them because you both share joy for the activity. 4. Understand teenage time zones. We need to recognize that our teenagers naturally, work in a different time zone than we do. This is not bad, or wrong, just different. We don’t get mad at people in NY because they work in a different time zone! When we ask them to do something, and they say “sure, “in a bit” or “yeah, give me a while.” Instead of being irritated because they are not doing it immediately, or on our time zone, let’s be glad they have said YES. They said YES!!! If we respect that, they will not only actually do what we have asked, but they might even do it sooner. If we know this is how they work, we can ask sooner, explain better. Instead of insisting immediately. 5. Be a Consultant, not a Manager. Up to this point in our children’s lives, we have been the manager of their lives. We manage all the aspects. Then, our children hit the teenager years and they fire us as their managers. So parents usually do one of two things. They either abandon their kids…"good luck with everything, hope you make it." They become extra controlling and try to force their kids to do what they want. Being a consultant is more about influence and less about control. Consultants share their expertise and knowledge to help attain goals and solve problems. When we speak to our children we need to ask them for help, ask them for their ideas and opinions, rather than telling them what we believe they should think or do. This can be really hard because we have been there, we know what the future holds if certain decisions are made, or not made, but it is their time to learn for themselves. That is our job, to help them do that. When we are parenting teenagers, it can be very easy for us to get caught up in the consequences when our children make mistakes. Now, there does need to be consequences. Absolutely, BUT…. A few things to consider. Consequences should fit the crime and they should have kids DO SOMETHING, opposed to taking something away. Mow the lawn, opposed to loosing their phone. BUT it is the follow up that we as parents usually forget. AFTER the consequence, sit down with your child and ask them “was there any part of you that thought you should call home when you were going to be late for curfew”? OR, did the thought ever cross your mind that maybe you should have left earlier so you were home on time”? They will say yes! They will, and when they do, ask them…”WHAT DO YOU THINK STOPPED YOU FROM LISTENING TO YOURSELF?” “WHAT GOT IN THE WAY OF YOU LISTENTING AND TRUSTING YOUR THOUGHTS”? Then, move on, don’t’ lecture. And don’t get lost in the consequence. It is over and done. Do the teenage years worry you? What tips can you add for parenting teenagers? Don't miss Part 2 of our Parenting Teenagers Series. By the time we are done, you will have all you need to tackle the stage in your child life. Everyone wishes to be a best parent, but not everybody become great parenting. Nowadays parenting is most significant public health issue facing our society. Since I am dissertation tutor or writer and providing business dissertation writing services - http://www.dissertationhelp.uk/business-dissertation/ at Dissertation Help UK (which is UK’s best leading dissertation writing services provider consultancy) and according to me trust is powerful tool and key for parenting because it understanding a balance between both parents necessity to be familiar with what is moving on their children’s life and teenagers need for privacy. It’s really challenging topic which is you discussing here in a right way. The teenage years are a time of enormous change for all kids because they are trying to find out who they are, what they like, and where they are going. And parents are also very worried for their children because parents playing very important role in kids life. My friend is looking for best tips for parenting teenagers who is also providing nursing degree personal statement with me at UK’s well-known consultancy Personal Statement Folks where I am currently working as a personal statement writer. So I am also suggest these tips to her and I am sure it surly solve her problem. Excellent job! Keep it up! Nowadays parenting teenagers can be a big challenging because teenagers time is huge change time of every kids. So many parents find it hard to adjust to changes in their child's behavior as they grow up. And you are giving here best tips for parenting teenagers which is very helpful for my sister who is worried about handling problems and difficult situations with her teen as she is working women and providing academic writing services with team of Secure essay writers Australia at Australia’s top leading educational writing services provider consultancy Secure Assignment Help. I am sure she would be find solution after reading these tips. "Practice influences a man to idealize. "best essay The more you consider, the more are your odds to get past. Even if you decide not to have children,best pacifier for newborn baby I'm sure you've met children and thought about how it happened. These are the Best Tips for Parenting Teenagers, every single advice for parents are extremely useful.Teenagers at this age are flexible and can adapt things more easily and this is the time to make them follow on the correct path.I once asked Someone Write My Essay For Me on this related topic where I got some knowledge about parenting teenagers.